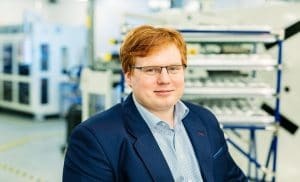 Tesla CEO Elon Musk is underestimating the “R&D hell” to get to higher energy density ultracapacitors, says Taavi Madiberk of Skeleton Technologies. With Tesla acquiring ultra-capacitor manufacturer Maxwell Technologies, the global attention is now focused on one of the world’s most advanced energy storage technologies – ultra-capacitors as an alternative and supplement to conventional battery technologies, especially for electromobility. What is the innovation gap? Tesla CEO Elon Musk, who studied ultracapacitors in Stanford during his PhD, is underestimating the “R&D hell” to get to higher energy density ultracapacitors, Madiberk pointed out. “We do not see Tesla closing the gap any time soon. In fact, key engineering people from Maxwell/Tesla have joined Skeleton recently,” he claimed. “Musk has previously stated that he is a big fan of ultracapacitors, but we need a breakthrough of in terms energy density,” he added. Madiberk also announced that they are expanding their manufacturing and R&D capabilities in Germany and have a clear road-map of hitting 60 Wh/kg, while retaining charging times measured in seconds and a cost point lower than high power batteries.